Today is May 8 and I haven’t accomplished a single thing from the 10 goals I set in my last post. Why am I so terrible at this? Just to get it out in the open: Jason and I are getting married on August 31st at the Minnesota Renaissance Festival! People keep asking me how wedding planning is going and I have a tough time answering this question because I’ve sort of hated it (the ‘to do’ list is still about a mile long and I think this blog has demonstrated how terrible I am at completing ‘to do’ lists lately). At least now I can talk about how fun the actual day will be. We have both been going to the festival for years and years and years, through rain and shine and high humidity, and it’s always fun! I’ve started our website, this weekend we’re meeting our wonderful photographer to make a plan, and we both have outfits mostly ready. We still need to nail down a couple of the bigger details (like, say, the ceremony itself), but I’m hoping to be productive with those things this weekend. 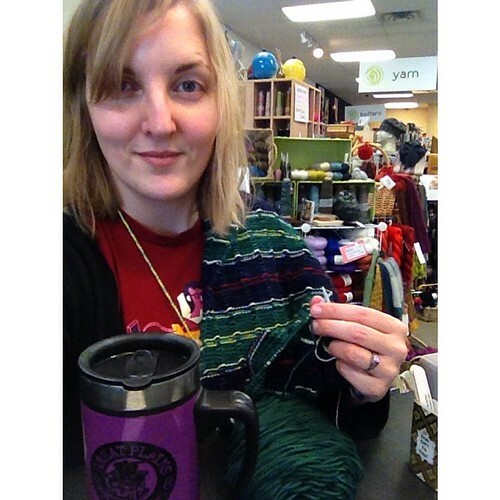 I have been knitting a shawl to wear to the ceremony for about two months now. And since we decided on the date, I feel like it’s all I’ve been doing because panic — will I get it done in time?! I can get at least 6 rows knit during my morning bus commute. There will be a lot of ends to weave in. Ugh. But it will be so wonderful to have and every stitch reminds me of how much I totally dig my husband-to-be. During this last week, Bertine sent me an email that the session we brought to MinneWebCon was accepted as a session for That Conference in August. Two weeks before the wedding. It’s a three-day, Monday–Wednesday conference near the Wisconsin Dells. It also happens the week before my friend, Jen’s, wedding in South Dakota. It’s been quite a while since I’ve been in three states in a one week span (not including vacations to the East Coast where visiting a different state every five minutes is normal) (after I published this I realized I do the Minnesota/South Dakota/Iowa thing a lot). Yes, I did forget that we had submitted our talk for this conference — but it will still be a fun mini vacation and a good distraction from last-minute wedding stress. 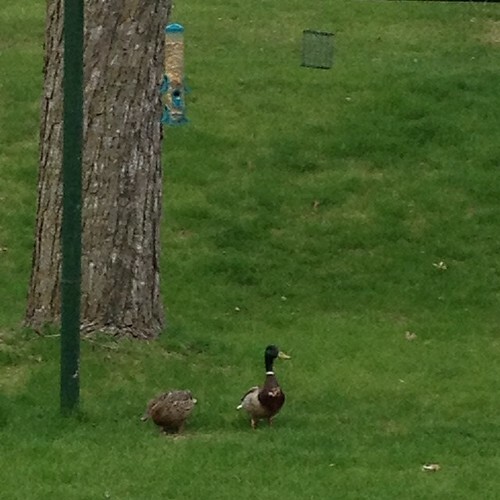 The only birds I’ve seen at my birdfeeder so far this Spring were ducks.